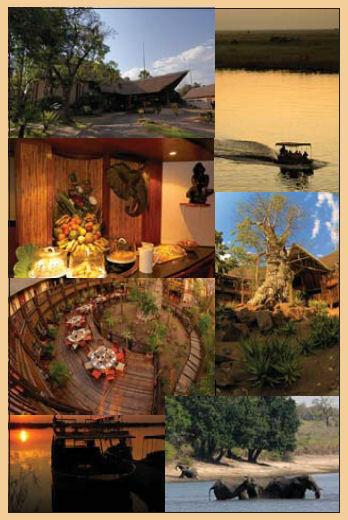 The venue, Mowana Lodge in Kasane, is a perfect setting within unique bush and river surroundings. It is an ideal base for the wildlife, bird, and safari enthusiast. Each delegate will experience a safari game drive and a cruise along the Chobe river with a myriad of wildlife. You may be greeted by the yawn of a hippo or witness a pride of lions at their kill, or hear the hyenas cackling and the vultures screeching as they await their turn. For birdwatchers, there are over 400 different species native to the Kasane environment. The venue's Serondela restaurant has a range of gastronomic delights, where, amongst other dishes, they serve kudu, warthog, impala, wildebeest, and crocodile, for those with adventurous tastes. Mowana - meaning Baobab, is a luxury lodge situated a mere 100km west of Victoria Falls, on the Chobe River, a short distance from the entrance to the Chobe National Park. The park is world renowned for its elephant population - the greatest concentration of these magnificent creatures on the continent. There are a 107 luxury rooms with full en-suite bathrooms, and 4 suites - all rooms are river facing with air-conditioning, mini bars, hairdryers, tea and coffee making facilities, ceiling fans, mosquito nets and electric insect repellents. Facilities at Mowana include a swimming-pool, set in a natural landscape; the Serondela Restaurant offers excellent cuisine inspired by the many flavours of Africa; the Savuti Bar overlooking the ever-changing Chobe River; the Boma Terrace for light meals throughout the day and the pool bar; a guest lounge for private entertaining; a hairdressing salon in a tree house, with a view of the river. Activities at Mowana include walks, mountain biking, seasonal tiger fishing, bird watching, game viewing on a river cruiser or in open-air vehicles with expert game rangers and trackers, breakfast and sunset cruises, traditional theme evenings at the African Village, trips to - and helicopter viewing of - the Victoria Falls, mokoro (local canoe) trails, river rafting on the Zambezi, a 4 countries-in-a-day trip (Botswana, Namibia, Zambia, and Zimbabwe) - you are guaranteed of being kept busy during your stay! The lodge is situated on its own estate on the banks of the Chobe River, 8 km from the world famous Chobe National Park. Mowana is 8 km by car (tarred road) from the international standard airport at Kasane serviced on a regular basis by flights from Johannesburg, Gaborone, and Maun. There are also daily flights from Johannesburg and Harare to the Victoria Falls (85 km away) where the Lodge's transfer service picks up guests. At the convergence of the Chobe and Zambezi Rivers, 10 kms downstream from Mowana, the four countries of Botswana, Namibia, Zambia, and Zimbabwe share a common meeting point. The Chobe National Park covers an area of approximately 10 700 square kilometres. The park was established in 1961, and the first Game Warden, Mr Pat Hepburn, was appointed in April 1962. It is home to the largest concentration of elephants in Africa, estimated at 45 000. Indigenous to the park is the puku and Chobe bushbuck. Other game, such as lion, leopard, buffalo, cheetah, kudu, giraffe, and an abundant bird life of approximately 450 species, add theatre to the magical kingdom. Serondela Camp, 10 km west of the park gate, is Chobe's most accessible campsite. According to game drivers, Serondela was once an inhabited village, which was uprooted and shifted to Kasane when Chobe became a national park. By day, campers are under constant surveillance by cheeky baboons, who long ago learnt that all the best pickings come from tents and backpacks. One of the best ways to enjoy the riverfront is to take a river trip in the late afternoon, when the hippos amble onto dry land and the riverfront fills with elephants heading down for a drink and a romp in the water. A Chobe visit will probably entail a cruise or game drive, during which you will have an excellent chance of observing lions and cheetah, and by day, the water is full of hippos, which submerge at dawn and emerge at dusk. Buffalo are present in their thousands, and amid the scrub live numerous giraffes and zebra.